TRUCKER RESERVATION SYSTEM: It’s debuting at the Port of Virginia on March 1. NIT is the first terminal to carry reservation requirement at Port of Virginia. Port of Virginia will launch reservation system at NIT on March 1. Reservation system “is another important step forward” for the Port of Virginia. The Port of Virginia on March 1 will debut the first phase of its PRO-PASS Trucker Reservation System (TRS), an innovation that will provide multiple benefits to the motor carriers servicing the port, cargo owners, logistics companies and the port’s terminal operations team. For more than two years, representatives of the port’s innovation and operations teams have been collaborating with local motor carriers and software development firms to create a useful system that will drive greater efficiency for truck-borne cargo flowing to the terminals. The reservation system is being deployed in phases, starting March 1 at Norfolk International Terminals (NIT) and then it will migrate to Virginia International Gateway this summer. Three years ago, the port’s IT and Operations teams began developing a system to help manage the flow of trucks to and from the terminal. At the time, the project was seen as part of the solution to congestion at the gates during peak hours and a planning tool for terminal operations to help prepare for the next day’s truck volume. An important part of the reservation system at NIT was the opening of the new $42 million, technology-driven North Gate complex. The 26-lane gate, which was opened in the summer of 2017, allows for motor carriers to enter and exit the terminal in a seamless transaction. The gate’s technology package was developed to include TRS; at VIG, the hardware and technology infrastructure for TRS is already in place. 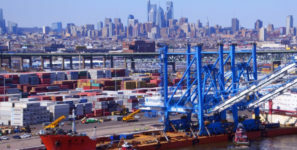 The port is committed to a phased roll-out of TRS. In the initial phase, motor carriers calling NIT between 5 a.m. and 7 a.m., Monday through Friday, must have a reservation Additional mandatory hours are planned as the TRS gains a firm footing in the trucking community.